Loktak Lake is the world’s only floating freshwater lake. It is located about 53 kilometers from Imphal, India. It is also the largest freshwater lake in northeast India. This lake covers an area of about 312 square kilometers. It serves as a source of water for irrigation, drinking water supply and hydropower generation. The lake has multiple ring-shaped land masses that float on it. These floating landmasses are known as phumdis or phumshongs. They are made up of weeds and are surrounded by colorful water plants and water chestnuts. The phumdis are a heterogeneous mass of vegetation, soil, and organic matters at various stages of decomposition. There is a national park on the lake which is Keibul Lamjao National Park. It is the only floating national park in the world. This national park is also one of the phumdis and also the largest one. In 1966, it was initially declared a sanctuary but in 1977, it was declared a national park. This lake is fed by the Manipur River and various tributaries. It has just one outlet named the Ungamel Channel. Loktak Lake and the Keibul Lamjao National Park are rich and abundant in biodiversity. Some of the most abundant raptors in this region include the black eagle and the shaheen falcon. On March 23, 1990 the lake was initially designated as a wetland of international importance. This lake is also home to many resident and migratory birds making it a bird watchers’ paradise. Declan, Tobin. " 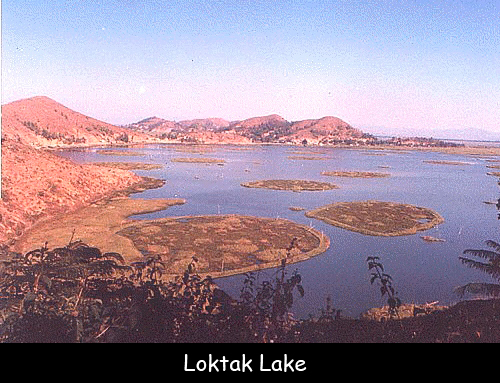 Fun Facts for Kids about Loktak Lake ." Easy Science for Kids, Apr 2019. Web. 24 Apr 2019. < https://easyscienceforkids.com/loktak-lake/ >.